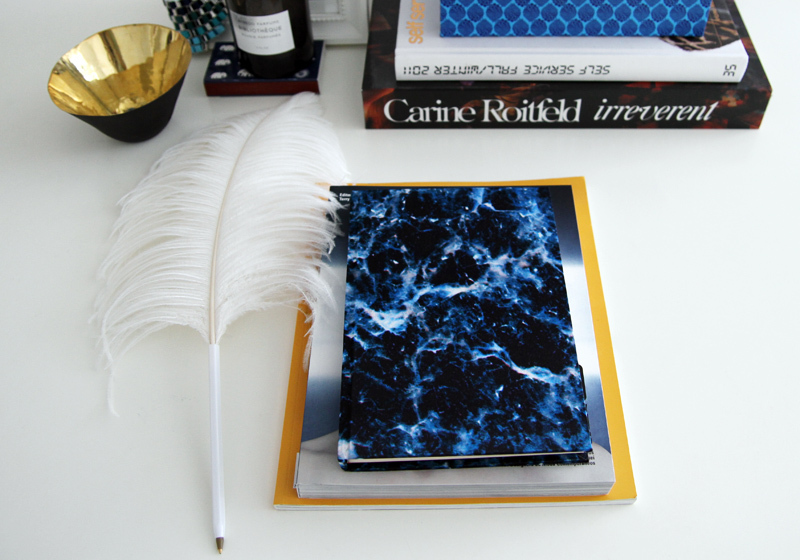 This entry was posted in Details and tagged desktop, journal, margiela feather pen, net-a-porter, weston silk journal by Carolina Engman. Bookmark the permalink. SOO COOL! I want one to! Beautiful! I’m exactly the same, I could spend a fortune in stationary shops & yet I never use what I buy in fear of ruining it, I have awful ‘doctors’ handwriting too! The print really is stunning & oh, that Margiela pen, I’m so jealous! Oooh it looks cosmic!! Like the depths of outer-space! I’ve got the same obsession, too! I love notebooks and I, too, never write in them because of my handwriting. Haha. Lovely. i am the exact same!! i can’t explain it.. i’ve just always collected pretty journals and lugged them around in my bag.. although i’m sure you treat yours a bit better than that:-) even if you never write in it it’s still worth it, it’s just beautiful.. love the pen too! That is a stunning notebook, so special and looks so pretty here! It’s lovely I also have a soft-spot with notebooks I even had one with a picture of me with my friends, but with nothing wrote on it. It is simply stunnig…love it!! It’s a beautiful journal indeed. Look at this print, no wonder you felt in love with it. writing with swag and class! Gorgeous notebook. Goes so well with the feather pen. I love writing things down in my notebook and I can never resist a cute design of both notebook and pen! I know just what you mean, I have also had an obsession with stationary ever since I was a child, love journals, diaries and notebooks in every shape and form! love the MMM feather pen! it is soo cute!! I have your same obsession with journals!! Love that it’s hand-stitched. I have your same obsession!! Love that it’s hand-stitched. I know what you mean about a lovely notebook and this one is no exception – incredible colours and pattern! want one!, have a notebook obsession too! I just fell in love with it too! Looks as if you’re peering into another galaxy. beatuiful book, love that it’s silk too. I agree. The print of the notebook is stunning. I wouldn’t dare to write in it either. você é linda! Adoro seu insta. I Love stationary as well, especially note cards, the only problem is I never want to give the note cards away to anyone. I like that feather pen a lot. Join my give away now! Every word in your post sounds so familiar to me. I always keep buying pretty notebooks, too, and I never write anything in them! Often I turn them into inspiration books. Really great, too! Oh my, it’s really beautiful! I too am a fan of notebooks but I actually write in them ;) so a small suggestion: on the 1st page write the day you got it, the place you bought it from (store, country or city) and city you were in when you received it. you can leave everything else in blank, but at least little things will keep your notebook collection traceable. You will love it! Enjoy! I’ve heard these notebook crushes before ;) I have the same one and this one is beautiful! You should look up the story behind the Weston brand… It was on a tv programme in the UK as he was discovered during an open call for new brands at Liberty. He won’t be what you are expecting; tbh you’ll probably love you’re notebook all the more for it! I think the journal is amazing. It’s not always the shoes and bag that can be fab but also these little things or details that others might ignore. Oh my god, I’ve got exactly the same as you. Ever since I was a kid I loved lovely notebooks to, but I never bought many because I didn’t write in them either. I never knew what to write in them and my awful handwriting would ruin them to. I am exactly the same! I love buying pretty journals! I also have a little notebook.I write secrets every night. It makes me happy or sad. But I love it. I also have an obsession of notebooks and didn’t write anything on them! haha I have plenty of them. I love the cover, it’s so unique and it’s silk!